Want to try more traditional wet shaving? A good choice would be to get the best beginner safety razor. This is a good step before going forward to trying to learn to use a straight razor. As the name says, it is safer as you’re using a sharp tool, with a good portion of the blade not exposed. This offers an extra layer of protection in case you slip or make a bad stroke. Straight razors don’t offer that luxury as the blade is completely exposed. For those starting out in trying a more traditional form of shaving that our granddads used, here are the products to go with. Best Beginner Safety Razor: Our top choice when it comes to anyone who wants to start shaving with a DE razor is Edwin Jaggers DE89bl. This is very popular with hirsute people as this razor gives a fantastically close shave, almost as close as a straight razor. It is also very forgiving which makes it ideal for anyone starting out. That way you don’t end up cutting yourself too often. The head fits all DE blades, making it easy to replace them. We do suggest giving a few different DE blades a try to see which ones fit you best before settling on a specific brand of blades. We also like that the whole weight and balance of the razor makes it sit easy in your hand and glide effortlessly over the skin. This lets you get a smoother shave. The chrome finish guarantees no rust with the added advantage that it heats up whilst you rinse and retains that heat during the whole shave giving a mild and pleasurable experience with no nicks or cuts. Holding the razor is also easy either wet or dry, and it helps to eliminate any slips or mishaps that can often happen in a steamy, wet bathroom. A well-made and quality product that could last a lifetime. Next on our list of best safety razors for beginners is this heavy Merkur 34C. This is precision German manufacturing at its best. It comes in the form of a heavy and robust razor, which makes it ideal for any beginner. This helps you learn how to wield a DE razor, as there really is no effort in shaving. The whole thing rests comfortably heavy in the hand and makes perfect contact with the skin, giving a relaxing feel when shaving. The extra weight makes it easier to hold the device in your hand, while the handle has pretty much the same length as that of a disposable razor. This makes the transition much easier. A handy feature is the knurling on the grip, and it helps ensure the razor does not slip or move in your grasp. This helps in eliminating cuts, or at least keep them at a minimum for those starting out. Alongside all this, the blade replacement is simple for a new starter or an old hand. Cleaning the device is likewise simple. Adding up all its features along with performance, makes this product among the best safety razors in the market. All in all, this is a great option for beginners to use and will make your shaving experience easy. For those who are starting out with wet shaving another good option is the Merkur 180. 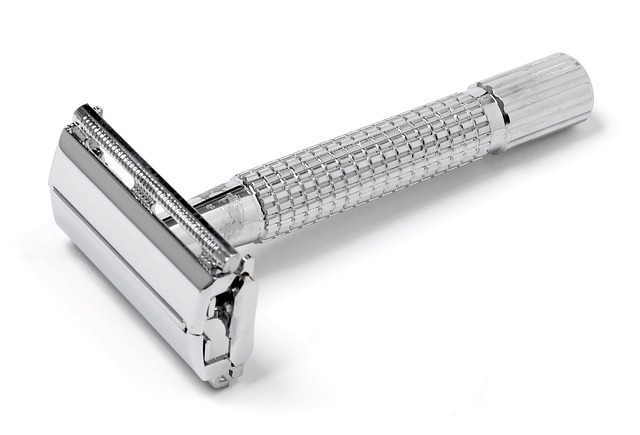 Better known as the long handle safety razor, it is labeled as such because of the extended length of the grip. This is a better choice for individuals who have bigger hands and find using the regular razor handles a bit too small for their liking. The long handle also suits those who want to get ‘more hold’ of the their shaving tool. The Merkur Long Handled Safety Razor is well-made and has a quality feel to it as soon as you pick it up. This makes it a great value for money option especially as it is so affordable. The unit isn’t as heavy as the 34C but has a good balance and weight to it. The weight allows you not to apply too much pressure, which can elevate your risk of skin burn and awkward rashes. But the most prominent feature is the longer handle that gives the razor excellent balance and ensures that even the biggest of hands can grip properly. The added guard ensures a safer shave and also makes the Merkur ideal for beginners or for somebody that is a tad clumsy when shaving. This is an ideal starting safety razor for anybody who is just new to the business of wet shaving. Offering a combination of length and good weight, this offering from Parker Safety Razor is another good product that beginners can consider. The Parker 99R is a razor that is billed as a “Super Heavyweight”. it will certainly feel good sitting in your hand, and the longer handle also adds to the overall quality feel to the razor. It has a sure grip and is easy to hold and operate. This is one of the main reasons many users, be it beginners or experiences shavers, like it. The extra weight allows the razor to float over the skin, cutting back on irritation. A particularly good feature is that the head is low profile so all those awkward places, for instance under the nose, are easily accessible. The day to day cost of owning a Parker 99R make it ideal for those just starting out shaving. The replacement blades are really cheap and there really is no maintenance. This razor will deliver a close, affordable and comfortable shave with very little knowledge of ever previously handling a safety razor. The best beginner safety razor, is easy to handle as well as very forgiving. It helps you learn how to wield a blade without cutting yourself too often. They’re also very economical so you don’t have to spend a lot of money when you’re just starting out.